Call now to set up your FREE Consultation!! 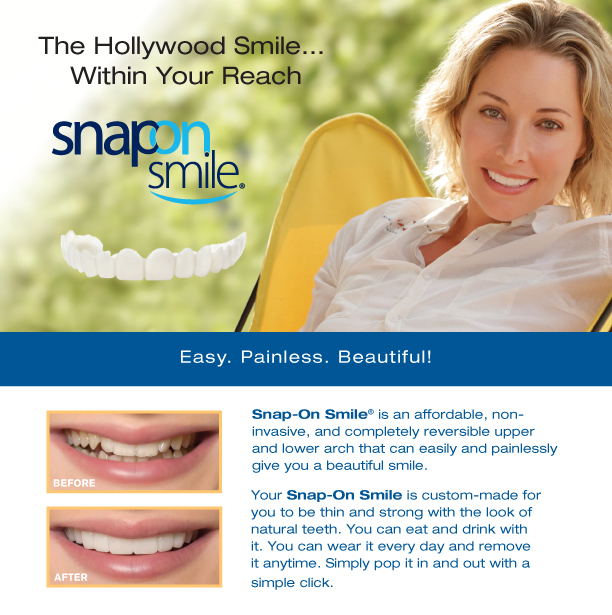 Snap-On Smile is a patented, easy and painless way to obtain a beautiful smile. After years of extensive research and development, your dentist can now provide you with a Snap On Smile that is thin and strong with the look of natural teeth. You can eat and drink with your Snap-On Smile. It's easy to care for and it is a temporary solution. It's available for upper and lower teeth. All insurance will be filed by our office on behalf of each patient if applicable. Most cosmetic procedures are NOT covered by insurance and are responsibility of the patient. The Snap-On/Snap-It cases must be paid by the time the appliance is delivered. Warranty may be purchased for this appliance, you have 30 days to purchase it after receiving your appliance. Each Snap-On Smile comes with a Cleaning Solution as well as an antibacterial gel. Additional Solution and Gel sold separately.